Each 8 gram charger makes about a quart. 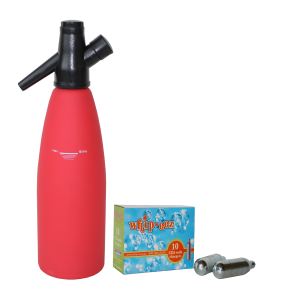 Co2 (carbon dioxide) is an odorless, colorless, non-flammable gas. It does not contain any minerals, salts or other solid ingredients. 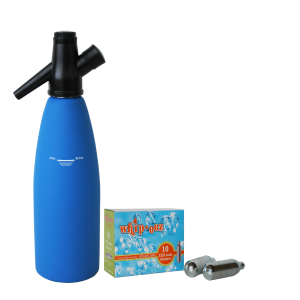 It is used worldwide for food preparation, deep freezing and to produce carbonated soft drinks and soda water. 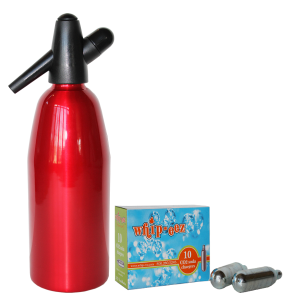 Whip-eez brand Co2 canisters are available for the North American coffee shop, restaurant, bar, ice cream shop, gourmet food market, or anyone who wants to make sparkling water in their home. These soda chargers measure 2-9/16″ long and 11/16″ in diameter. Non-threaded. 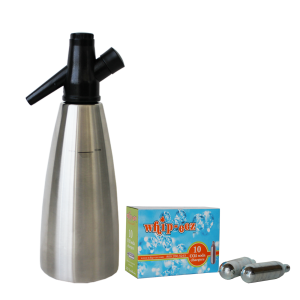 Find recipes here for your soda siphon! I’m writing this review because chargers either work or they don’t, right? Well these work. I read the process on how these are made and I am impressed with the quality. I know that by using very cold water (I mean like 31 degrees cold) and letting the gas saturate the water for about an hour, I get the best, fizziest seltzer water on tap at my home. I buy all my chargers here. My only choice. These work great, taste fine, and cost less than other soda chargers like the iSi brand recommended in the instructions with my soda siphon. I really think they work better than the iSi ones, making the water even more fizzy. I’ll probably buy a 100 case next. My vintage soda siphon was brought back to life. These work! Soooo happpppy!! I recieved my order in 3 days after I placed it and it was nicely packaged. I will buy here again. When charging my siphon the first time, it scared me. You kind of think to yourself, what if??? But after the first charge you learn fast how easy they are to use. As a homeowner I use these a lot. Experimenting with recipes, I make different flavored sodas. Very competitive price. Worked as promised, I got FIZZ. I have told other friends about this brand and now they buy them too. Instead of mixing 3 cans of water with your frozen can of fruit juice, mix in 3 cans of freshly made whipeez soda water. Instant fruit sparkling drinks!